Favourite sister of Henry Joy McCracken (q.v. ), with whom she shared the progressive, philanthropic heritage of the McCracken and Joy families. 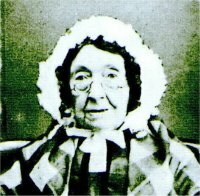 Like Henry, she was interested in reviving the ancient poetry and music of Ireland – they were both enthusiastic supporters of the Belfast Harp Festival of 1792 – and devoted herself to a number of progressive causes. 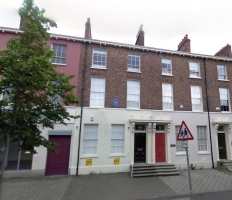 After Henry’s execution in 1798 she and her sister Margaret opened a muslin business at 27 Waring Street, Belfast; during the rest of her long life Mary Ann worked for various philanthropic causes, such as the welfare of women and children, the abolition of slavery, and political equality for women. 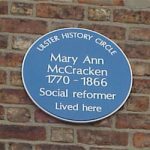 She was particularly interested in the Charitable Institution (the Belfast poorhouse). After Henry’s death she defied family opposition and brought up his illegitimate daughter Maria in the family home. 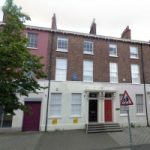 She was buried in Clifton Street cemetery, in the shadow of the poorhouse to which she had devoted so much of her energy. 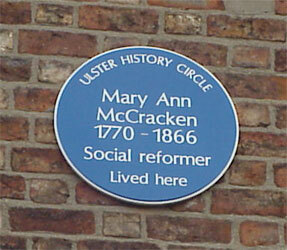 Location of plaque: At 62, Donegall Pass, where she lived for much of her later life.